Our objective is to produce high-quality, all natural, grass-fed Black Angus beef. During the summer, our animals range freely in our own pastures feeding on local grasses like timothy, red clover, orchard, and canary grasses. 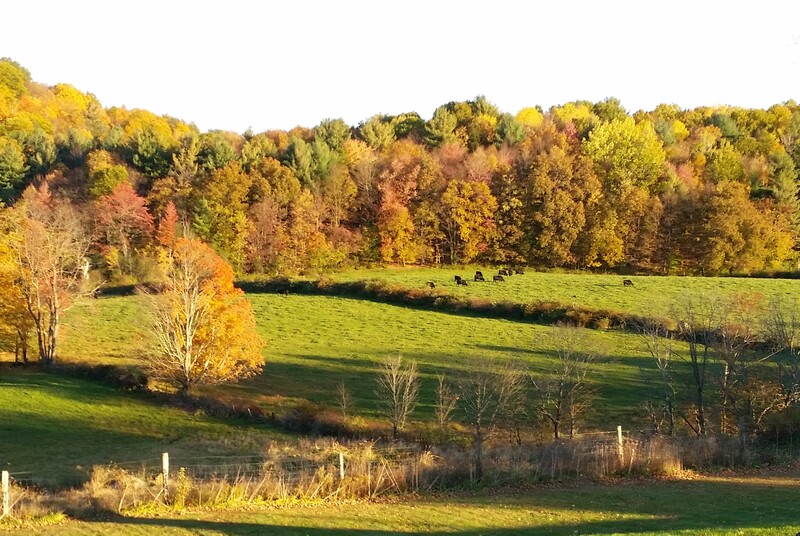 Late in the Fall they move to our winter pasture where they receive hay and grass silage cut from our meadows. Our cows are bred to calve in April and May. During the summer the calves’ main nourishment is mother’s milk but they begin to eat pasture grasses too. In October the calves are weaned and sorted into four groups – the best heifers to join the main herd, two or three top quality bull calves to serve as breeding bulls, other bull calves to become steers for the beef program, and heifer calves for sale. At this time all our calves receive a standard set of health vaccinations to protect them from various bovine viruses. After weaning the calves begin their winter feed program of high protein second and first cutting hay, and a small ration of wheat grain to support their fast growing, teen-age bodies. The following May the steers (and the main herd of brood cows with their new calves) return to the summer pastures. The steers remain on summer pastures until maturity in the fall when they weigh 1000 to 1200 lbs. At no time do the calves, steers, or any of our animals receive growth hormones or antibiotics.